OCT 13, 2018, 6:30 – 9 PM. Doors at 5pm, enjoy vendors and live music ar 5:30! VIP Ticket comes with VIP seating on stage, pre-show reception at 5:30, and swag bag sponsored by Fashion Outlets of Niagara Falls USA. Spectacular SPECTACULAR! 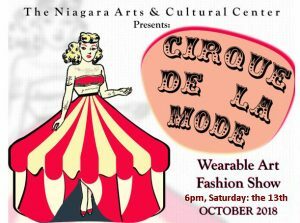 The Wearable Art Runway Show returns to the NACC with this year’s theme, “CIRQUE DE LA MODE”! This circus inspired event will have you on the edge of your seats with incredible creations by local designers. With designs inspired by Ring Masters, Fools, clowns, harlequins, Night Circus, Freak Show, Burlesque, Vaudeville and more – every design could be a SHOW STOPPER!